Urban Decay has to be one of my favourite make up brands, I love their ethos and style, it’s all very me. Anyone that knows me, knows I can’t be without my super black eyeliner and even blacker mascara. I’ve been a fan of the Urban Decay eyeliners for a while, but I’d never tried their mascara. I changed jobs recently and the Urban Decay Total Perversion Duo (shop) was part of my leaving gift. They all knew me very well! 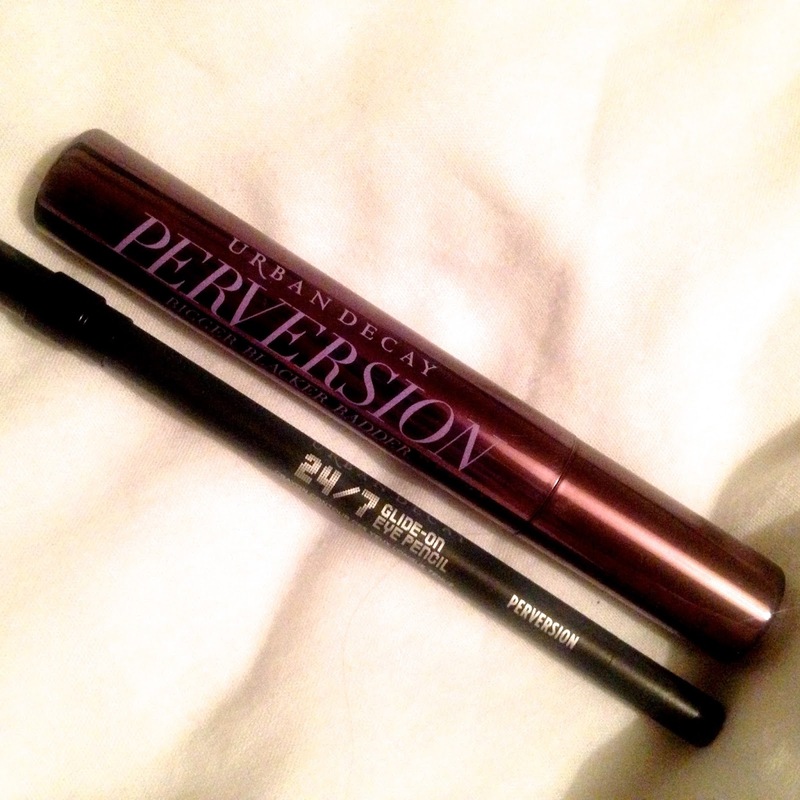 I was excited to give the Perversion Mascara and eyeliner a go. Blacker than black…they sounded right up my street! Spoiler alert…I’ve not stopped using them since. Urban Decay Total Perversion Mascara – Bigger, blacker, badder, essentially this does what it says on the tin. The mascara gives your lashes lots of volume and emphasises them with the blacker than black pigment. It holds a curl nicely and is smudge proof, or at least I’ve not managed to smudge it yet! It gives you defined, emphasised lashes that still look natural after one coat. Perversion layers like a dream to give you a more false lash effect. Whats more it doesn’t clump your lashes together. The packaging looks gorgeous too, it looks expensive and feels rather lightweight. The brush is a small plastic one which is perfect for coating each lash individually. It’s an all round amazing mascara. Urban Decay 24/7 Glide on Eye Pencil in Perversion – This is by far the blackest eyeliner I own. It is heavily pigmented and gives an amazing colour pay off. As the name suggests it glides onto your eyelids easily. Perversion is an amazing eyeliner for a smoky eye as it is easy to smudge and blend as soon as it is applied. On your eyelid the wear time is amazing, on the waterline less so. I’ve found it wears off quite quickly and tends to smudge under my eyes a little, meaning it’s definitely one to use for a cat eye or a smoked out look. All in all I do really like this eyeliner, I’m not one for liquid liners or pens so it’s become a staple in my make up bag. If you are looking for an eyeliner that doesn’t budge on the waterline, I would recommend Smoke and Black Market from Urban Decay. This set would make a gorgeous treat for any make up lover in your life, as far as I’m aware it is sold all year round, so its not just one for Christmas. Are you an Urban Decay fan?